Nifty opened flat but saw weakness creeping in from the word go and remained weak throughout the entire session of trade to close just below the psychological level of 6700 at 6694.35, a huge loss of 41.75 points. On a week on week basis the index was flat, down by just 1.55 points. The broader market though was also strong, with 892 advances to 592 declines. Best support still at 6600. Call option 6600-7000 added 12.50 lacs huge amount of OI with small profit booking seen at 7100 and above strike prices. Put option 6800 added 1.40 lacs huge amount of OI with profit booking seen at 6600 and lower strike prices. 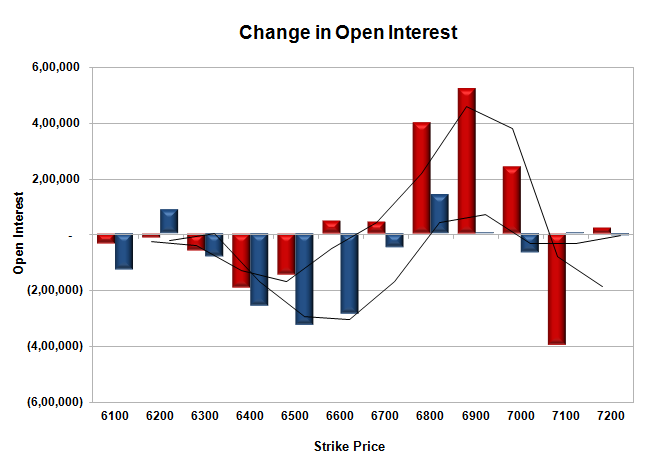 Nifty Open Interest is at 1,63,49,850 down by 7,99,900, with decrease in price, most probably huge long liquidation. Bank Nifty Open Interest is at 14,18,775 down by huge 1,66,575, with decrease in price, most probably huge long liquidation. FII’s sold huge 8.93 lacs Futures, mostly long liquidation, as their net OI decreased by 31891 contracts (includes 32392 longs to 50261 shorts for the day) and the average price per contract comes to around 6710.01. FII’s future open contract as on date is 356723. PCR Open Interest (Volume) is down a bit to 1.303. 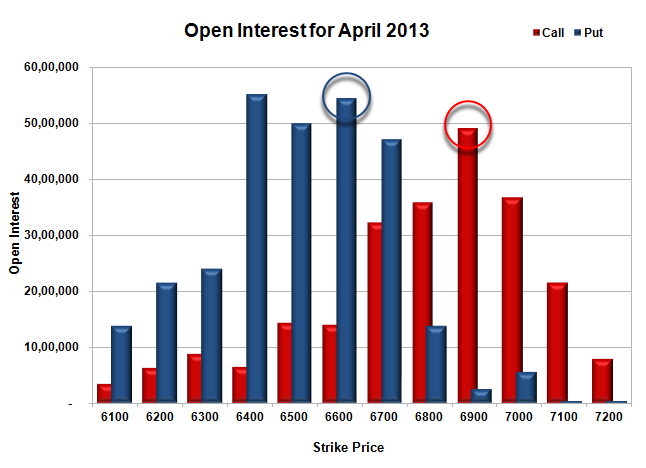 Initial support still at 6700, with huge OI of 47.05 lacs and below that at 6600 with huge OI of 54.51 lacs. Initial resistance at 6800, with OI of 35.78 lacs and above that at 6900 with OI of 49.01 lacs. 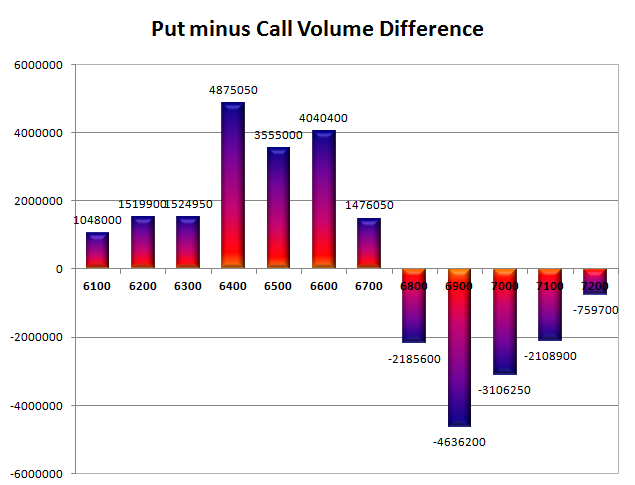 Day Range as per Option Table is 6659 - 6752 and as per VIX is 6615 - 6774 with 6707 as the Pivot.